If a person suddenly collapses and is unconscious, or if you come across someone who is unconscious, their heart may be beating but beating too fast or beating both too fast and in an irregular manner. An AED will include the primary machine, cables, and two pads. One pad will be negative and one pad will be positive. 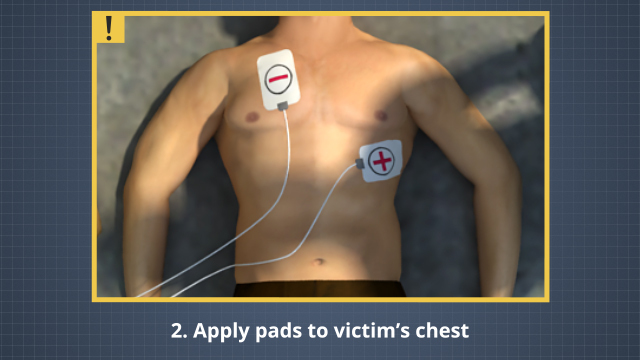 It's important to place each of the two pads in the correct location on the victim's chest. 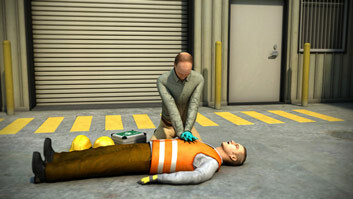 In some first aid situations, the victim's heart will be beating too quickly or in an irregular manner. In cases like these, an automated external defibrillator, also known as an AED, can be used to shock the person's heart back into a normal rhythm. In this course, you'll learn when and how to use an AED, including an automatic AED and a semi-automatic AED. When should emergency medical assistance be summoned in a situation requiring the use of an AED? 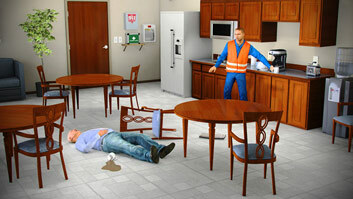 Always summon emergency medical assistance immediately or as quickly as possible in a situation that requires an AED. Do all AEDs work the same way? No, but there are different types that tend to work in the same basic manner. What's the best way to know how the AED at my workplace operates? Consult the instructions that the manufacturer included with your AED. Do all workplaces have an AED? What's the best way to learn if my workplace has an AED? Ask your manager or supervisor. What are the basic parts of an AED? 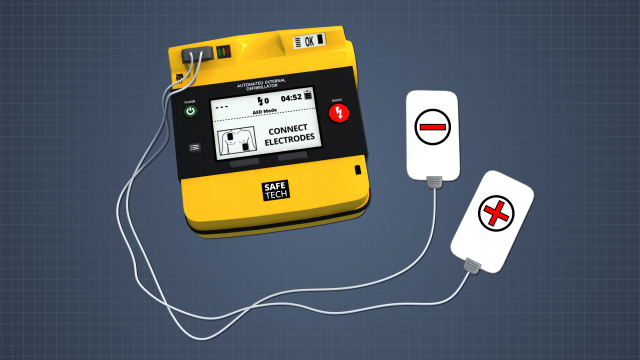 An AED will include a primary machine, cords, and two pads to attach to the victim's chest. Is each pad the same as the other? No, one is negative and one is positive, and you will have to place them in different parts of the person's body. When should one use an AED? If the person's heart is beating in an irregular manner or if it's beating too quickly. How can you tell if a person's heart is beating too quickly or in an irregular manner? The AED can diagnose that once it's put onto the person and used. What does the AED do if it determines that the person's heart is beating too quickly or in an irregular manner? 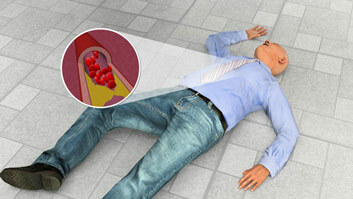 An automatic AED will automatically deliver an electrical shock to the person's chest. A semi-automatic button will prompt you to push a button that then delivers the shock. What does using the AED on a person do? 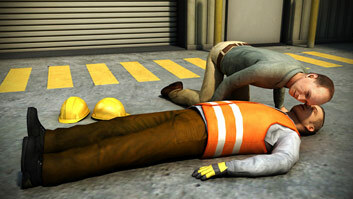 The AED can cause the victim's heart to fall back into a normal beating pattern. 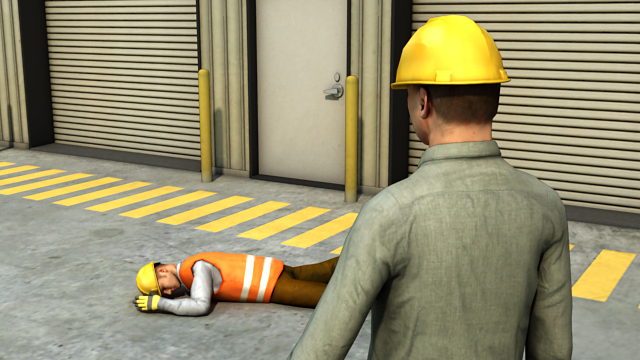 If a person suddenly collapses and is unconscious, or if you come across someone who is unconscious, any number of things may be wrong. In some cases, their heart may be beating, but beating too fast, or beating both too fast and in an irregular manner. In both cases, even though their heart is still beating, their body may not get enough oxygen. This can very quickly cause permanent brain damage or even death. 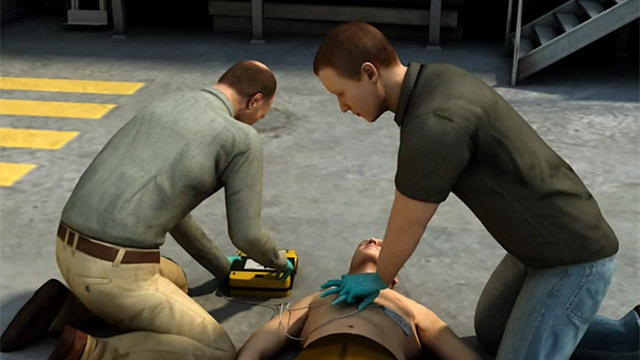 In this course, you'll learn how to provide first aid to a person with an irregular heartbeat by using an automated external defibrillator, or AED.